Introduction Programme to eliminate neglected tropical diseases (NTDs) have gained global recognition, and may allow for improvements to universal health coverage and poverty alleviation. It is hoped that elimination of human African trypanosomiasis (HAT) Trypanosoma brucei gambiense (Tbg) would assist in this goal, but the financial costs are still unknown. The objective of this analysis was to forecast the financial burden of direct costs of HAT Tbg to funders and society. Methods In order to estimate the total costs to health services and individuals: (1) potential elimination programmes were defined; (2) the direct costs of programmes were calculated; (3) the per case out-of-pocket payments (OOPs) by programme and financial risk protection indicators were estimated. The total estimated costs for control and elimination programme were reported up till 2020 in international dollars. The mean results for both direct programme costs and OOPs were calculated and reported along with 95% CIs. Results Across sub-Saharan Africa, HAT Tbg maintaining ‘Control’ would lead to a decline in cases and cost US$630.6 million. In comparison, the cost of ‘Elimination’ programme ranged from US$410.9 million to US$1.2 billion. Maintaining ‘Control’ would continue to cause impoverishment and financial hardship to households; while all ‘Elimination’ programme would lead to significant reductions in poverty. Conclusion Overall, the total costs of either control or elimination programme would be near US$1 billion in the next decade. However, only elimination programme will reduce the number of cases and improve financial risk protection for households who are impacted by HAT Tbg. Financing sustainable health systems will increase Universal Health Coverage, but there are unknown costs related to elimination of neglected tropical diseases (NTDs); in particular, human African trypanosomiasis (HAT) Trypanosoma brucei gambiense (Tbg). The cost-effectiveness of strategies to eliminate HAT Tbg have proven to differ by foci, but how this translates into financial burden for funders and the communities at risk is still unknown. National programmes that combine varying cost-effective strategies and lead to elimination of HAT Tbg will cost millions of dollars in the coming decade, but will improve financial protection (alleviate poverty) by reducing the occurrence of catastrophic health expenditures to households impacted by HAT Tbg. Several countries burdened with sleeping sickness may not be able to afford optimal elimination programmes based on gross national income levels. Decision makers interested in elimination should not only consider the costs associated with the national programmes but also the societal perspective when prioritising programmes for the elimination of NTDs. Health financing and funding support will need to be addressed if elimination goals and sustainable development goals to eliminate poverty are to be achieved. Over the last two decades, global health expenditures per capita have more than doubled, and continue to increase annually.1 In several countries a large proportion of the health expenditure is funded by patients’ out-of-pocket with severe consequences to the financial protection of the household. However, policy makers at all levels rarely take into account the potential consequences on a household’s economic conditions of health policies and interventions. In the last decade, neglected tropical diseases (NTDs) increasingly attracted the interest of global health investors and there is currently a global mandate to achieve disease elimination of several NTDs.2 In order to comprehensively define the economic implications for NTDs in particular for key stakeholders, an ‘Eradication’ or ‘elimination investment case’ (EIC) framework was developed.3 At present, this approach has been applied to onchocerciasis (‘river blindness’) and lymphatic filariasis (‘elephantiasis’), highlighting that investments in elimination or eradication of such diseases leads to economic, health and ethical benefits.4–11 Thus far, cost-effective elimination strategies for human African trypanosomiasis (HAT). Trypanosoma brucei gambiense (Tbg) have been identified,12 and the ethical considerations of each strategy have been formally assessed13; however, a summary of the direct costs required for national control and elimination programmes have yet to be ascertained. Recent technological developments in treatments, surveillance approaches and diagnostics, along with feasible vector control interventions19 have shown that there are new alternatives to treat, identify and prevent HAT Tbg that are cost-effective. Decision makers now need to calculate the annual and future budget implications to sustain elimination strategies, as well as consider the economic implications for the communities involved. This study aims to estimate the potential costs associated with these two perspectives. First, to forecast the financial impact that elimination programmes may need to sustain elimination targets; second, to alert decision makers of the implications for financial risk protection to households affected by HAT Tbg. In order to estimate the direct costs and financial risk protection impacts, the current control and potential elimination programmes at a national level needed to be defined. Then for each programme it was necessary to estimate the associated direct costs, households’ out-of-pocket payments (OOPs) and financial risk protection indicators. Our approach considers both the perspective of the national and global funders who are interested in the direct costs associated with HAT Tbg elimination (including health services and vector control), and a households’ perspective (ie, OOPs). The mean results for both direct programme costs and household expenditures are calculated along with 95% CI to express the uncertainty surrounding the mean simulations. Costs are discounted at 3% and reported from 2013 and 2020 for a time horizon of 7 years. A priority setting exercise was undertaken in order to define optimal programmes according to cost-effectiveness and probability of elimination based on a previously published economic evaluation for strategies including new technologies in the elimination of Tbg.12 The micro-strategies originated from potential approaches to elimination foreseen with technologies that became available in 2013 and onwards described in Steinmann et al.19 The strategies ranged from adding new ‘tiny targets’ (small insecticide-impregnated screens) for vector control in addition to the current ‘screen and treat’ programmes that are readily available, to including a new oral tablet (oxaboroles) treatment that may eliminate the need for prolonged in-hospital treatment. These were further combined in Sutherland et al12 and modelled as five mutually exclusive macro-strategies for elimination to determine cost-effective options per foci. These strategies for elimination were further combined into national control and elimination programmes, based on the following cost-effectiveness thresholds: US$200 per disability adjusted life year (DALY) averted, US$700 per DALY averted, and US$1500 per DALY averted. Each programme is briefly described within table 1, with additional details for the approach provided in appendix A1. Hence, any given national programme (eg, Control, Elimination I, and so on) is the total cost of the low, moderate and high areas (refer to Equation 2). are relative the treatment in the foreseen programme (ie, Control 2020, Elimination 2020, and so on), refer to appendix A3.2 for additional details. The proportions of CHE at 10% and 25% were defined by the sustainable development goal (SDG) 3.8.2 (30). For the purpose of this analysis, we assumed that only 36% of affected households would actually incur medical expenses.27 The rationale being that in many cases, households forgo payments that could potentially lead to catastrophic expenditures.27 We relax this assumption in the sensitivity analysis (SA). To visualise the impact that OOP had on a household relative to the poverty line (PL), a Pen Parades’ diagram, was generated. This image is often used to assist policy makers in reviewing the impact that OOP may have on subjecting households to poverty (impoverishing) or pushing families with an income below the PL, further into poverty (‘immiserising’). In addition, we also conducted a SA within the FPA to evaluate the impact on financial protection when there were: variations in the proportion of households that incur OOPs related to HAT Tbg, higher and lower definitions of the PL, and increases and decreases to the annual discount rate. A normal distribution was applied to case estimates, while gamma distributions were applied to all cost inputs. A PL of US$1.9 per diem28 was used to account for the economic status of sub-Saharan Africa. It was assumed that the PL would be the same in 2013 and 2020. For each programme, 10 000 simulations were run to generate the mean reported outcomes and 95% CIs. To understand the potential impact of poverty with current and future technologies, the programme “Control 2013”14 was used as a comparative baseline measure to the alternative options. The outcomes of the FPA are reported across sub-Saharan African and by country income levels. Additional details for input parameters used in the FPA are provided in appendix A3. No patients or public participants were involved in this study. From 2013 until 2020, the cumulative costs of control and elimination programme of the strategies modelled are listed in table 2. The results demonstrate that maintaining the current control programme, without taking new technologies into consideration, will incur a total cost of US$630.6 million across sub-Saharan Africa. Introducing the first option of elimination programme (‘Elimination I’) leads to a total financial impact of US$410.9 million; while scaling up to ‘Elimination II’ would yield a total of US$988.0 million. Implementing ‘Elimination III’ across all sub-Saharan nations would lead to a total cost of US$1248.1 million. The net impact of each programme in comparison to ‘Control’ demonstrates that ‘Elimination I’ would actually lead to cost-savings, while net increases of US$357.4 million and US$617.5 million for ‘Elimination II’ and ‘Elimination III’, respectively. If one evaluates the proportion of programme costs by GNI country levels, 80%–87% of financial burden for HAT Tbg will allotted to low-income countries (LICs) (refer table 2). In particular, the Democratic Republic of the Congo (DRC), which has the second lowest income of all the endemic sub-Saharan countries, but the highest number of cases, would be responsible for 65%–72% depending on the programme selected. Further more, if the GNI of a country is used as a proxy to determine a cost-effectiveness threshold, all countries could scale up to ‘Elimination I’, while 77% could consider ‘Elimination II’. Less than half (46%) of the endemic countries would be able to consider ‘Elimination III’ as good value for money using GNI as a threshold. For each programme, as depicted in figure 1, the majority of costs for control and elimination programmes are driven by screening and diagnostic costs that come from passive surveillance, and/or active screening campaigns (68%–90% of total costs). The ongoing costs for control also begin to plateau after several years; while, although the costs of elimination programmes are high in the earlier years, they decline to 3%–5% of the overall costs in later years. 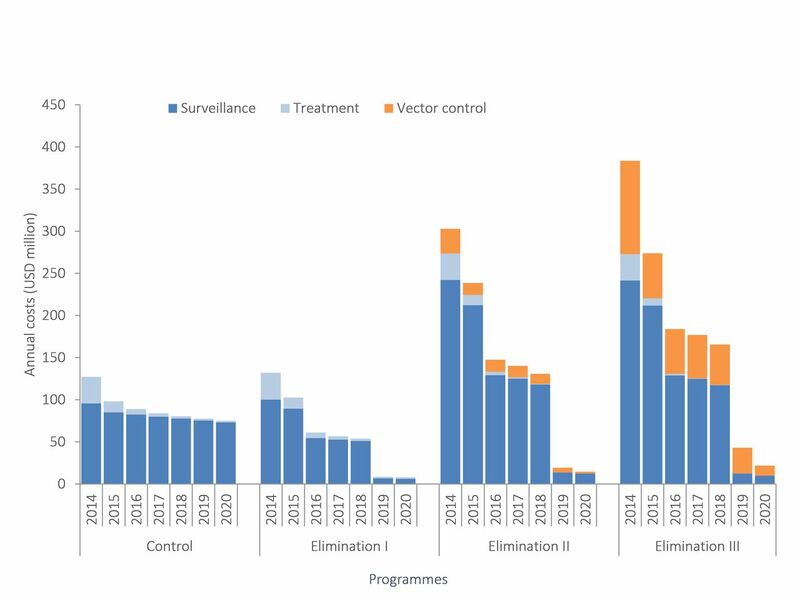 The additional cost of vector control to ‘Elimination II’ and ‘Elimination III’ programmes contribute to 9% and 29% of the total programme costs, respectively. The year 2014 includes costs from 2013 and 2014 combined; USD, US dollar. The total number of expect cases and impacts related to poverty for all programmes completed in the financial protection analysis (FPA) are summarised in table 3. Overall, in comparison to the baseline year 2013, maintaining a similar ‘Control’ programme till 2020 will not have an impact on poverty indices. Although the number of cases were forecasted to decline, the OOP health expenditures related to attending treatment centres for HAT treatment will still lead to impoverishment (22%), immiserisation (31%) and CHEs at both 10% and 25% of HAT Tbg households. Scaling up to ‘Elimination’ programmes, that result in medications that can be taken at home or within local villages, will reduce the risk of impoverishment in the future by at least 5% for all elimination programmes in comparison to control and reduce the number of households facing CHEs to less than 1% (a reduction of 63%–30% depending on the thresholds selected). In addition, ‘Elimination’ programme lead to the fewest number of forecasted cases in the future. This dual impact is on households with Tbg is shown in the series of Pen’s Parade diagrams illustrated in figure 2. The Pen’s Parade diagramdepicts each household and their respective incomes pre-consumption (prior toincurring non-medical (NM) medical expenses (M) related to HAT Tbg and post-consumption (householdincome after incurring non-medical (NM) needs and medical (M) HAT Tbg expenses); HAT Tbg, human African trypanosomias Trypanosoma brucei gambiense; OOP, out-of-pocket payment; PL, poverty line; USD, US dollar. Additional FPAs were evaluated by country income levels (refer table 3). The results again demonstrate that the (LICs) would be the most vulnerable to OOPs with 99.4% and 98.8% of the households experiencing CHEs at 10% and 25%, respectively if ‘Control’ is maintained. In addition, although at first glance it appears that there are fewer being impoverished, this is only due to the fact that the majority of the households in LICs will risk immiserisation (approximately 85%) for healthcare payments related to HAT, even with ‘Elimination’ programmes. 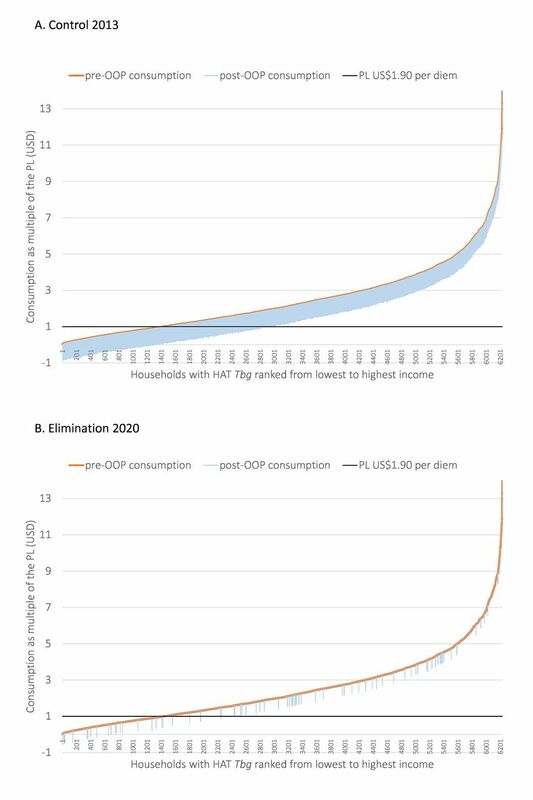 Low-income countries and middle-income countries (LMICs) have smaller populations of households at risk of impoverishment (0.49%) and CHEs when ‘Control’ is in place, however; introducing ‘Elimination’ programme could also eliminate CHEs and reduce the proportion of those impoverished to less than 0.5%. There is not foreseen risk to poverty related to HAT Tbg expenditures in upper-middle income countries (UMICs). The results from the univariate SA of the FPA across sub-Saharan Africa did not deviate from the base case analysis when changes in the discount rate were completed, or the PL was lowered to US$1.25. In additional, even when 60%–75% of households paid the OOPs related to HAT Tbg, the FPA results remained similar. However, if only 36% of households incur OOPs when a family member is diagnosed with HAT, the impoverishing and immiserising proportions would be similar across all programmes, with fewer people experiencing CHEs. Nonetheless, the ‘Elimination’ programmes would still be the only programmes that could fully alleviate households from experiencing CHEs. The results of the SA are available in appendix A3. Across sub-Saharan Africa, HAT Tbg control and elimination programmes will require substantial funding and fiscal commitments over the coming years. A ‘Control’ programme will lead to fewer cases in the coming years, but it will lead to delays in reaching elimination targets and it will still cost millions of dollars to funders. In addition, a ‘Control’ programme will have no impact on reducing OOPs and poverty indices encouraged by the SDGs. Moving to ‘Elimination’ is an attractive option, but the ‘Elimination’ programmes that are most likely to reduce cases and alleviate OOPs related to HAT Tbg (Elimination II and III), are relatively expensive for the countries that share the greatest burden of at risk communities. The majority of the incremental funding required will need to be allocated to in-country surveillance and diagnostics annually. This alerts a cause for concern for stakeholders seeking elimination, as traditionally only the treatments for HAT Tbg have been donated with the majority of healthcare costs reliant on non-profit organizations (NGOs) and the fragile national health system. In addition, in order for these programmes to reach the at risk population, substantial logistical and technical capacity would be required29 30 which is not fully reflected in the simulated costs of the programmes. The results of this two-part analysis demonstrate that there is a need for the global health community to prepare substantial funds for elimination, not only for treatments and preventative measures (ie, vector control) but also to the health system itself. In addition, it has demonstrated that the strive to elimination programmes may alleviate the households’ risk of impoverishment and thus contributing to reach the millennial SDGs. The results of the analysis on financial burden highlight that ‘Elimination’ programmes are the most favourable in achieving global goals. However, decision makers will have to assess the fiscal space needed especially since availability of new HAT treatments has historically had delays in Pan-African uptake in the market. There may be a risk that LICs will opt for the less aggressive ‘Elimination I’ programme that would be cheaper. However, this will lead to a slower decline in cases compared with other elimination options and it could jeopardise the long-term goal of eliminating HAT. In addition, although the costs for OOPs expenses and direct programme costs have been converted to international dollars for ease of comparison, the true heterogeneity of costs across sub-Saharan still need to be captured which will require cost data collection at the national level at the very least. There are also economic gains from elimination that could be considered in future EIC assessments. For instance, tsetse free areas may increase access to water areas without menace and even land use opportunities. Future research in prospective FPA could consider if and how additional income to at risk communities (ie, households) may result from elimination and assist to offset OOPs related to CHEs. Although this analysis highlights the financial benefits of elimination programmes, at the time of its inception, it was assumed that novel interventions would arrive on the market as scheduled. The efficacy of fexinidazole has been proven34 and, while the European Medicines Agency (EMA)’s Committee for Medicinal Products for Human Use has adopted a positive scientific opinion in November 2018, the timeframe for its actual deployment is uncertain. In addition, previous modelling12 estimated the arrival of a novel one time treatment in 2018, while it is currently estimated to be submitted to the EMA in 2021.35 In the interim, subsidies for travel, accommodation and food could be considered, with the current national sleeping sickness control programmes (NSSCPs) to encourage patients to attend without the risk of incurring in financial hardship. Nonetheless, the scale up of elimination activities has begun in at least nine endemic nations,36 and there is a continual decline in cases supporting the model’s estimations. Our results also assume 80% coverage is maintained for surveillance programmes. This coverage rate shows promise in leading to elimination but may be hard to achieve. Although 30% of the high transmission areas are covered, on average, only 2% of the continent is experiencing some level of screening. Furthermore, there are several countries that have not established formal NSSCPs (ie, Gambia, Guinea-Bissau, Liberia), although foci risk areas exist.37 Hence, the scale up to elimination will be substantial not only in funds, but for logistics on the ground. Scaling up coverage may reveal also that there are more cases than once thought, and adjustments to the elimination forecast and budgets will have to be made. Long-term commitments to funding postelimination will be needed as the possibility of asymptomatic cases and unknown reservoirs comes to the forefront. An example of this was seen recently in Ghana where one case was found in 2013 after 12 years of no cases being reported. Overall, the results demonstrate that an ‘Elimination II’ foci–specific programme that deploys: targets in high-risk areas with annual surveillance, adopts new technologies in all areas and implements biannual surveillance in moderate and low transmission zones, remains within cost-effectiveness thresholds for some low and lower-middle income countries. It could also achieve elimination goals for 2020 in the long-run and leads to financial protection for families impacted by HAT Tbg. Global stakeholders and funders should ensure that low-income countries whose NSSCPs are unable to secure funds nationally for elimination should be supported as they share a disproportionate load of the disease burden. The elimination of HAT Tbg does have a high cost, but with continued efforts and support from global stakeholders, it is hoped that those already at risk of poverty will not be the ones to pay for it.
. Global Health Expenditure Database. Available: http://apps.who.int/nha/database/Regional_Averages/Index/en [Accessed cited 2018 Apr 5].
. Lessons learned from developing an eradication investment case for lymphatic filariasis. In: Advances in parasitology, 2016: 393–417. (cited 2018 Apr 5).
. The Third Report: Country Leadership and Collaboration on NTDs. Available: http://unitingtocombatntds.org/report/third-report-country-leadership-and-collaboration-ntds [Accessed 08 Apr 2016].
. Global health Observatory Data Repository [Accessed 07 Jul 2015].
. Implications of heterogeneous biting exposure and animal hosts on trypanosomiasis brucei gambiense transmission and control. PLoS Comput Biol. In Press2015.
. Food production and consumption trends in sub-Saharan Africa: prospects for the transformation of the agricultural sector. Regional Bureau for Africa: United Nations Development Programme, 2012.
. Human African trypanosomiasis in a rural community, Democratic Republic of Congo. In: Emerging infectious diseases. Vol. 13. Kinshasa, Democratic Republic of Congo: United States: Programme National de Lutte contre la Trypanosomiase Humaine Africaine, 2007: 248–54.
. World economic outlook database, 2014. Available: http://www.imf.org/external/pubs/ft/weo/2014/01/weodata/index.aspx [Accessed 12 Sep 2014].
. ECB statistical data Warehouse, 2014. Available: http://sdw.ecb.europa.eu/ [Accessed 12 Sep 2014].
. 64% of Patients Avoid Care Due to High Patient Healthcare Costs. Available: https://patientengagementhit.com/news/64-of-patients-avoid-care-due-to-of-high-patient-healthcare-costs [Accessed 05 Apr 2018].
. Tracking universal health coverage : 2017 global monitoring report, 2017. Available: http://documents.worldbank.org/curated/en/640121513095868125/Tracking-universal-health-coverage-2017-global-monitoring-report [Accessed 20 Apr 2018].
. The last steps towards innovative oral therapies, 2017. Available: www.dndi.org [Accessed 01 May 2018].
. Implementation of HAT diagnostics. Available: https://www.finddx.org/ntd/hatprojects/implementation-of-hat-diagnostics/ [Accessed 01 May 2018]. Contributors CSS and FT conceived the idea for the study and its design. CSS further developed the study design, completed the analyses and wrote the first draft of the manuscript. Both CSS and FT contributed to further drafts, edits and finalisation of the final manuscript. Funding This project was supported by an Eradication Investment Case (EIC) of onchocheriasis, lymphatic filariasis and human African trypanosomiasis grant #OPP1037660 supported by the Bill and Melinda Gates Foundation (BMGF). Patient and public involvement statement No patients or public participants were involved in this study.